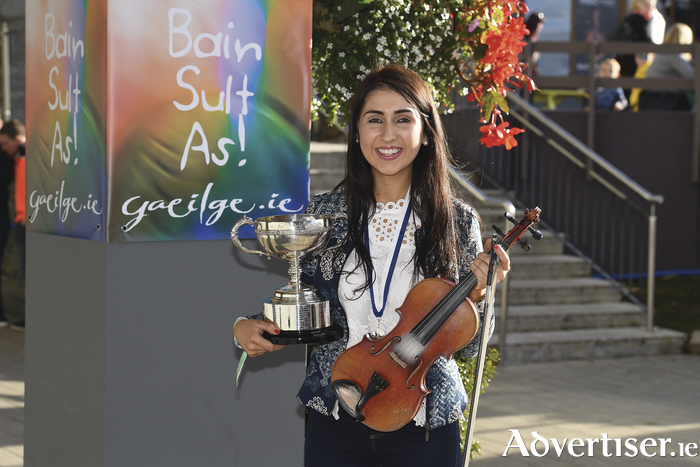 Éadaoin Ní Mhaiciín from Claremorris who won the fiddle competition at the recent Oireachtas Festival. Éadaoin Ní Mhaiciín, from Claremorris, won the fiddle competition at the recent Oireachtas Festival in Kilarney. The annual Oireachtas Festival is a mecca for lovers and performers of the traditional arts, and this year’s competitions again received a huge number of entrants aged from six years to 68. The range of competitions included storytelling, sean-nós dancing and singing, and the famous lúibíní competition in which two people perform a rhyming story through song. The highlights of this year's festival included the newly composed piece by Peadar Ó Riada, entitled "I gCuimhne Laochra" (Remembering Heroes ), that was commissioned by An tOireachtas as part of its 1916 commemortations. A central theme in this year's festival was the future of Irish language drama. This year's programme featured an exciting and innovative line up of radio plays as well as a forum on the future of Irish language drama.